In a medium bowl, whisk together eggs, honey, vanilla, and water, until smooth. Add apple and coconut. Mix to combine. Scoop or ladle (approximately 1/4 C.) into heated (and greased, if needed) waffle iron. Cook approxiamtely 1 minute*, or until golden brown. Serve with 1 T. warm maple syrup (use the real stuff). *My waffles only took about 1 minute to cook through, so keep an eye on them. These waffles are delicious!!! They will not produce that crispy outer crust that your normal, sugar-laden waffles provide, but they will offer a flavorful, soft, and satisfying breakfast option. 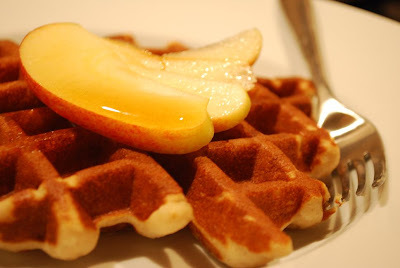 Try these waffles (in moderation, of course), you will not be disappointed. This batter is SO easy...it was actually the result of having only two eggs in the fridge (together we usually eat 6 or 7). Instead of shredded apple and coconut, I used 2/3 cup organic apple sauce. I mixed all the wet ingredients, save the egg whites, with the dry ingredients. I then folded the mixture into the egg whites trying to preserve as much volume as possible. After cooking, the result was a very airy and light waffle. They still are softer than regular waffles but the edges crisp in the toaster when reheating. Thanks for checking out my blog and sampling this recipe. I will definitely try your version when I get home! Just eating these for breakfast now! Love how moist they are. Not missing the crispy crust at all :-) . Thanks! made these this morning for my little waffle monster, he loved them! Downloaded and printed out this recipe probably a year ago but didn't try it till this past Sunday. I must say, this is awesome! The batter was exactly the right consistency for my belgian waffler; I was in heaven. My son and I made a feast of them! I tried your recipe this morning and it turned out great. The waffles were delicious and fluffy, but very filling. I was worried about the batter sticking to my waffle maker but it didn't (maybe because it had a little grease from a previous use). Definitely a make again. Thanks! I used Carina's modified recipe and loved it! I found a need to add quite a bit more almond milk for softer batter- & with some fruit and maple syrup, these are quite like the real thing!